William Branham early in his ministry taught that the evidence of the baptism of the Holy spirit was not speaking in tongues. However, he changed his mind several times as to what he truly thought it was. The questions is - Did he get it right? William Branham always taught that the baptism of the Holy Spirit was a "third work of grace" in a Christian's life, following justification and sanctification. This is the traditional Pentecostal understanding of scripture. Although he may have believed it early in his ministry, none of William Branham's recorded sermons indicate that he believed that the initial evidence of the baptism of the Holy Spirit was speaking in tongues. Rather, he initially taught that the evidence of the Holy Spirit's work in a Christian was love. He later changed this to a belief that it was the fruit of the Spirit as outlined in Galatians 5:22-23. However, starting in 1964, William Branham began teaching that the evidence of the Holy Spirit in a believer's life was that they received the Word for the age in which they lived. This was his way of saying that if you didn't believe what William Branham taught and believed him to be a prophet of God, you did not have the Holy Spirit. Does that Bible teach that believers should seek a “baptism in the Holy Spirit” after conversion? No one who denies the Son has the Father. Whoever confesses the Son has the Father also. 24 Let what you heard from the beginning abide in you. If what you heard from the beginning abides in you, then you too will abide in the Son and in the Father. Whoever says “I know him” but does not keep his commandments is a liar, and the truth is not in him, 5 but whoever keeps his word, in him truly the love of God is perfected. By this we may know that we are in him: 6 whoever says he abides in him ought to walk in the same way in which he walked. those who have received the baptism of the Holy Spirit. The contrast between being “in the flesh” and “in the Spirit” is a contrast between belonging to the old age of sin and death and belonging to the new age of righteousness and life. So characteristic of these respective “ages” or “realms” are flesh and Spirit that the person belonging to one or the other can be said to be “in” them. In this sense, then, no Christian can be “in the flesh”; and all Christians are, by definition, “in the Spirit.” We miss Paul’s intention if we think of being “in the flesh” here as the condition of mortality that continues to characterize even believers (Nygren), or as the moral weakness and proneness to sin that, more lamentably, we still possess (Dunn). For the rest of the verse makes absolutely clear that (1) to be a Christian is to be indwelt by God’s Spirit; and (2) to be indwelt by God’s Spirit means to be “in the Spirit” and not “in the flesh.” Paul’s language is “positional”: he is depicting the believer’s status in Christ, secured for him or her at conversion. To be sure, a condition is placed on this being “in the Spirit”: having the Spirit of God dwelling in the person. But, as 1 Cor. 3:16 shows—addressed to the “carnal” (1 Cor. 3:1–3) Corinthian Christians, no less!—Paul believes that every Christian is indwelt by the Spirit of God. Indeed, this is just what Paul affirms in the last part of the verse, where he denies that the person who does not have the “Spirit of Christ” can make any claim to being a Christian at all. In other words, for Paul, possession of the Spirit goes hand-in-hand with being a Christian. However much we may need to grow in our relationship to the Spirit; however much we may be graciously given fresh and invigorating experiences of God’s Spirit, from the moment of conversion on, the Holy Spirit is a settled resident within. That Paul in the same verse can speak of the believer as “in the Spirit” and the Spirit as being “in” the believer reveals the metaphorical nature of his language. In the one case, the Spirit is pictured as entering into and taking control of the person’s life; in the other, the believer is pictured as living in that realm in which the Spirit rules, guides, and determines one’s destiny. And you also were included in Christ when you heard the message of truth, the gospel of your salvation. When you believed, you were marked in him with a seal, the promised Holy Spirit, who is a deposit guaranteeing our inheritance until the redemption of those who are God’s possession—to the praise of his glory. The seal of the Spirit was received by the Gentiles here addressed as it had been received earlier by Jewish Christians—when they believed. The verbal form used here is identical with that found in Acts 19:2, where Paul at Ephesus asks a group of “disciples” if they received the Holy Spirit when they believed; it is a participial form meaning “having believed” or “on believing. When the Gentiles believed the gospel, they were sealed with the Holy Spirit of promise. The aorist participle ‘believed’ is best interpreted in this context as being coincident with the main verb ‘you were sealed’. The participle does not here express antecedent action,125 as though the Gentiles believed and then subsequently were sealed with the Holy Spirit. Rather, the believing and being sealed were two sides of the one event. A similar conjunction with the same verb form is found in Acts 19:2, where Paul asks a group of ‘disciples’ at Ephesus if they received the Holy Spirit when they believed. William Branham's teaching on the evidence of the Holy Spirit changed significantly over his ministry. We've had great men to cross our nation: Billy Graham, Oral Roberts, and many of those great warriors of faith, great men, personal friends of mine. And I know they're good men, filled with God's Spirit and wonderful teachers. Notice, three stages: justification by faith, sanctification through the Blood; baptism of the Holy Spirit; then perfection, glorified. And there's just too much doubt in the church yet to take a flight. That's right. Got too many quills, too many loose feathers, so you know what He does? He gives us the third work of grace. She stands back there, and takes these big wings, and she begins to flop them like that, and a mighty rushing wind comes down through there, and all the loose feathers begin to fly. Oh, when that mighty rushing wind comes from heaven, the baptism of the Holy Ghost, all the doubting feathers will fly out of you. Now, there is also three in perfection, of the steps of grace, to the Church; justification, sanctification, baptism of the Holy Ghost. That consists of the New Birth, just like a natural birth is typed by it. Which, a woman giving birth to a child, the first thing comes forth is water, blood, and then life. The Bible said, in First John 5:7, or 7:5, I believe it is, that said, "There are three that bear record in Heaven; the Father, the Word," which was the Son, "and the Holy Ghost; these three are One. There are three that bear witness in the earth;" the Word, "the water, blood, and Spirit. Water, blood, and Spirit; these three agree in one." See, He makes three Comings. He come in three sons' names. He come in a trinity; Father, Son, Holy Ghost. See, all of it the same Christ, the same God, all the time. Now, we know He come to bring three works of grace; justification, sanctification, baptism of the Holy Ghost. Everything, in God, is completed in three's. Just like now, this is going to hurt you. But I'm responsible with God's Word, willing to discuss It, any time. Here's where you Pentecostal people has made your mistake, many of you setting here, of teaching the initial evidence of the Holy Ghost, speaking in tongues being the Holy Ghost. Why, speaking in tongues is all right, but that is an attribute. That isn't the Holy Ghost; that's what the Holy Ghost does. 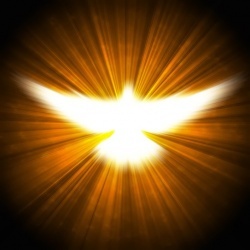 The Holy Ghost is the love of God. I can prove it by the Bible. "Though I speak with tongue of men and Angels, and have not love, it profit me nothing." If you want a apple tree, and just got an apple, you're a long ways from getting a tree. See, it's an attribute. Heavenly Father, tonight, knowing that hour is close, knowing that we're living in the end time, knowing that those old trees are going on, here is that vine bringing tonight, filled with the Holy Ghost, bringing forth fruit, the evidence of the Holy Spirit, being among us. How thankful we are, Lord. We could raise our hands and praise Thee and praise Thee over and over for all Thy goodness and mercy. How wonderful and how marvelous are Thy ways. We thank and praise Thee with all of our heart. We put so much stress on the evidence of the Holy Ghost. The Methodist said you have to shout 'fore you got It. A lot of Methodist shouted and didn't have It. The Pentecostal said speak with tongues when you got it. A lot of them spoke in tongues and didn't have It. That's right. But, brother, when you come to a place where you got love, it never will fail. So, there's nothing you can say is the evidence of the Holy Ghost, unless it's your life that you live. I believe in speaking in tongues, but I don't take it to be the only evidence of the Holy Spirit. No, sir. The fruit of the Spirit is the evidence. Now, don't you get a hold of that. I spoke with tongues, and that's the evidence of the Holy Ghost." If your life... If you can still cut your hair, if you can still do these things the Bible says not do; you could speak with tongues all day and night, and it's still nothing to do with God. The tree is known by its fruit. Now we have been constantly saying that the true evidence of being baptized with the Holy Ghost is for the believer to receive the Word for the age in which he lives. The evidence of receiving the Holy Ghost today is just the same as it was back in the day of our Lord. It is receiving the Word of truth for the day in which you live. Jesus never did stress the importance of the Works as He did the Word. The problem with William Branham's interpretation is that it is not based on the Bible. However, this passage can only be interpreted properly by the context of Jesus' words. Who was he speaking to? The disciples! When the Holy Spirit was poured out on the day of Pentecost, the Spirit did lead them into all truth and they wrote it down on paper to form the New Testament, the source of truth for Christians. It is clear that the apostles were the divinely authorized agents through which the Holy Spirit proclaimed the final revelation of Jesus Christ. Indeed, the apostles claimed this revelatory power (John 20:31; 1 Cor. 2:13; 1 Thess. 4:2; 2 Thess. 2:2; 1 John 2:19; 4:6), claiming the church was “built on the foundation of the apostles and prophets” (Eph. 2:20). The early church recognized this authority and “they devoted themselves to the apostles’ teaching” (Acts 2:42). The apostles were the eyewitnesses of Christ (Acts 1:22), even Paul (1 Cor. 9:1; 15:5–9). Since these divinely authorized channels of “all truth” died in the first century, it follows that divine revelation ceased with them. If revelation ceased, there was no longer a need for miracle signs of a new revelation. ↑ The Holy Bible: English Standard Version (Wheaton: Standard Bible Society, 2001), Ro 8:15–16. ↑ The Holy Bible: English Standard Version (Wheaton: Standard Bible Society, 2001), 1 Jn 4:13. ↑ The Holy Bible: English Standard Version (Wheaton: Standard Bible Society, 2001), Ro 8:14. ↑ The Holy Bible: English Standard Version (Wheaton: Standard Bible Society, 2001), Ga 5:22–23. ↑ The Holy Bible: English Standard Version (Wheaton: Standard Bible Society, 2001), 1 Jn 2:23–24. ↑ The Holy Bible: English Standard Version (Wheaton: Standard Bible Society, 2001), 1 Jn 4:6. ↑ The Holy Bible: English Standard Version (Wheaton: Standard Bible Society, 2001), 1 Jn 2:4–6. ↑ The Holy Bible: English Standard Version (Wheaton: Standard Bible Society, 2001), 1 Jn 3:24. ↑ The New International Version (Grand Rapids, MI: Zondervan, 2011), Ro 8:9–11. ↑ Douglas J. Moo, The Epistle to the Romans, The New International Commentary on the New Testament (Grand Rapids, MI: Wm. B. Eerdmans Publishing Co., 1996), 489–490. ↑ The New International Version (Grand Rapids, MI: Zondervan, 2011), Eph 1:13–14. ↑ F. F. Bruce, The Epistles to the Colossians, to Philemon, and to the Ephesians, The New International Commentary on the New Testament (Grand Rapids, MI: Wm. B. Eerdmans Publishing Co., 1984), 265. ↑ Peter Thomas O’Brien, The Letter to the Ephesians, The Pillar New Testament Commentary (Grand Rapids, MI: W.B. Eerdmans Publishing Co., 1999), 119. ↑ The Holy Bible: English Standard Version (Wheaton: Standard Bible Society, 2001), Eph 1:13–14. ↑ The Holy Bible: English Standard Version (Wheaton: Standard Bible Society, 2001), Jn 7:37–39. ↑ The Holy Bible: English Standard Version (Wheaton: Standard Bible Society, 2001), Jn 16:13. ↑ Norman L. Geisler, Baker Encyclopedia of Christian Apologetics, Baker Reference Library (Grand Rapids, MI: Baker Books, 1999), 471. This page was last edited on 24 June 2018, at 15:28.